The ocean of Hindu scriptural wisdom in the form of teaching of ancient master of the religion is too massive for single individuals. 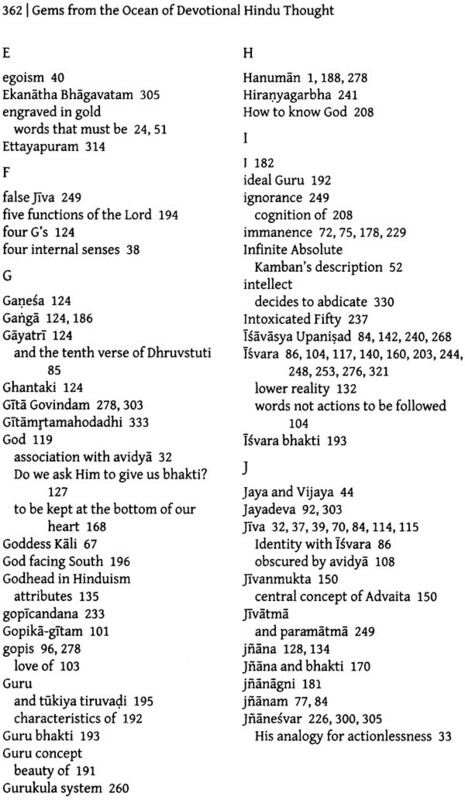 This book presents, however, a compact connected collection of such wisdom from the vast and deep literature on Devotional Hindu Thought. 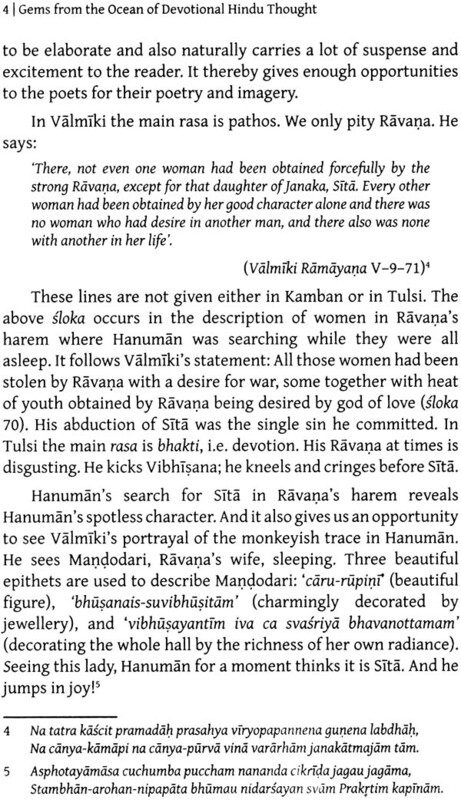 Starting with a comparative study of Sundarkanda in the tree monumental epics-Valmiki Ramayana, Kmba Ramayanam and Tulsi’s Ram Charimanas, it goes on to explain the deeper aspects of Devotion and Prayer through gems from the Bhgavatam and also through brief accounts of lives and achievements of the greatest devotees, Saints and masters who modeled Hindu thought over the centuries. 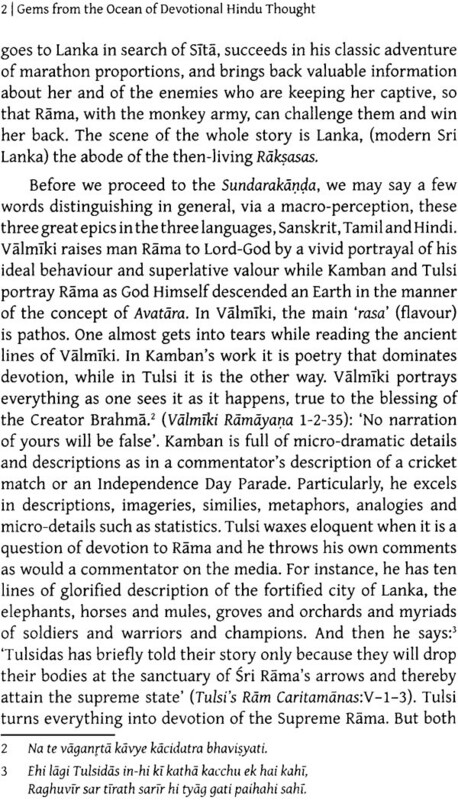 V. Krishnamurthy (b. 1927) has served the Department of Mathematics in Thiagarajar Department of mathematics in Thiagarajar College, Madurai; Annamalai University; university of Illinois, U.S.A and BITS, Pilani, where he was also Deputy Director for two decades. His mathematical research is in the area of functional Analysis, Topology, Combinatorics and Mathematics Education. 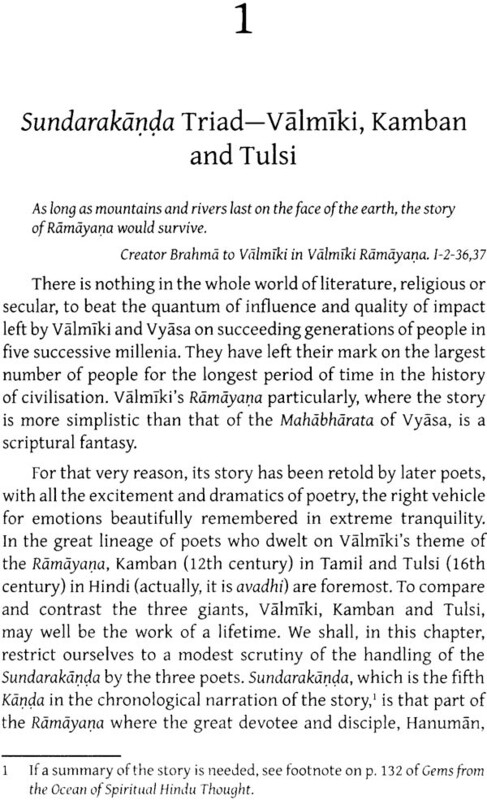 Prof. Krishnamurthy was also trained systematically in the traditional Hindu scriptures. 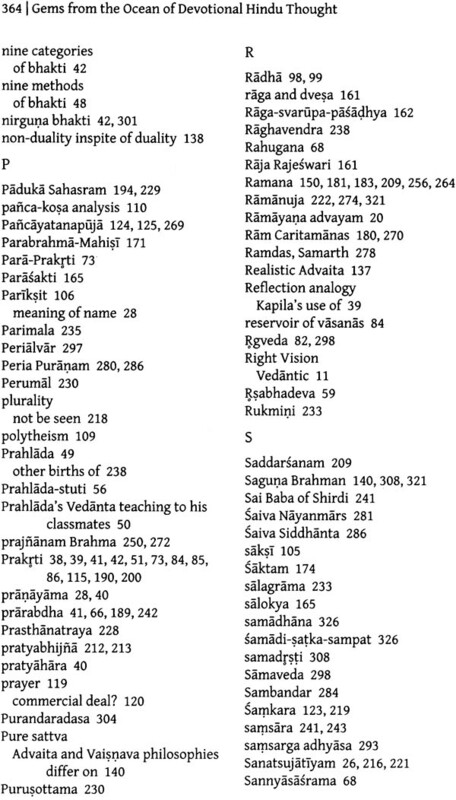 In addition to a good number of lectures on Hindu scriptural literatures and Vidanta, he has to his credit many book on Hinduism, including Essentials of Hinduism (1989; Hinduism for the Next Generation (1992); The Ten Commandments of Hinduism (1994); Science and Spirituality-A Vedanta Perception (2002); live Happily the Gita way (2008); and Gems from the Ocean of Spiritual Hindu Thought (2010). To the lotus feel of the one person. From whom I have drawn inspiration and guidance. (Even after he has been no more in this world). For the conception of everything in this book. He was a monumental example of a Karma Yogi, Ananya Bhakta and Atmajnani all put together in his day to day life which I could closely watch for twenty-five years because he was My Father Shri R. Visvananth Sastrigal. The central message of all the scriptures of our country is “seek God and seek Him in everything, every time.” All devotees are eager to know more and more about the path of spirituality. 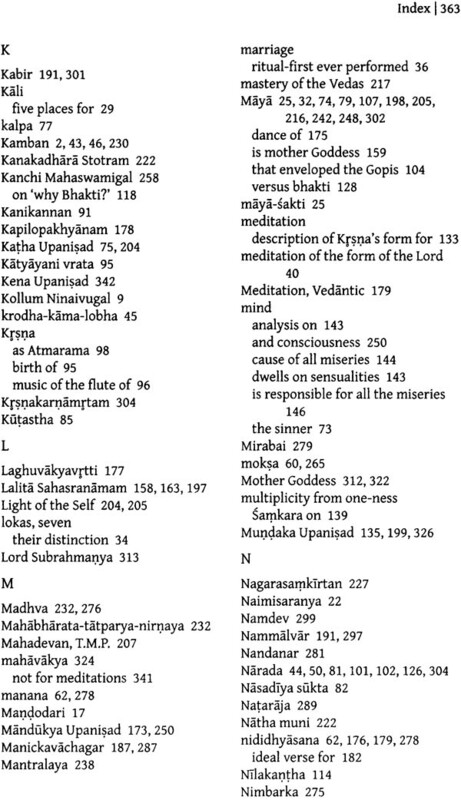 Prof. V. Krishnamurthy has succeeded in bringing out this message to the public by publishing this compact collection from our ancient scriptures which contain an ocean of thoughts and ideas of the sages of yore and it forms an invaluable source of advice and practical knowledge for a serious seeker of the Truth. You never feel alone in reading this collection of beautiful materials, which itself form part of an effort in our endeavour towards Godly life within and without. The loving kindness and the gentle guidance are ever present in this collection of gems, for the words of the Rishis vibrate with spiritual wisdom and a seeker of Truth can find a helping hand and a guiding light in this collection of the flowers of eternal wisdom. Prof. V. Krishnamurthy has gleaned the glittering pearls from the ocean of the words of the spiritual masters with great effort and his devotion and affection towards his father and teacher gave his strength and light to come out successful in this great Endeavour. 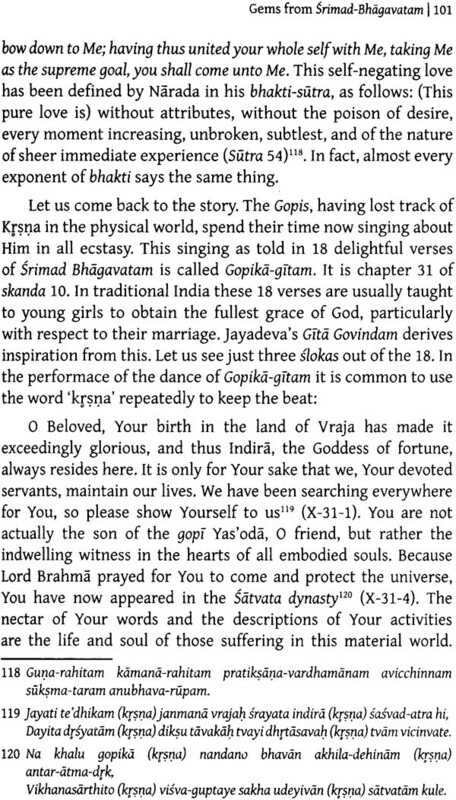 The narrations, the mantras and sloka from Vedas down to kavyas will certainly inspire the reader and give him a divine comfort, as mentioned in the Bhagavata, and the reassurance all through the spiritual efforts of the seeker of the Truth. The presence of the divine can so intimately be felt all through the passages of this wonderful book of collection and a reader can feel that God is talking to him through the Vedic Rishis personally. All the collections deserve appreciation. Some section, though seemingly simple and clear, require serious contemplation in order to understand fully their subtle significance. A seeker of the Truth may find this book of collections very useful in his day to day life and find relevant and helpful to one’s self study. 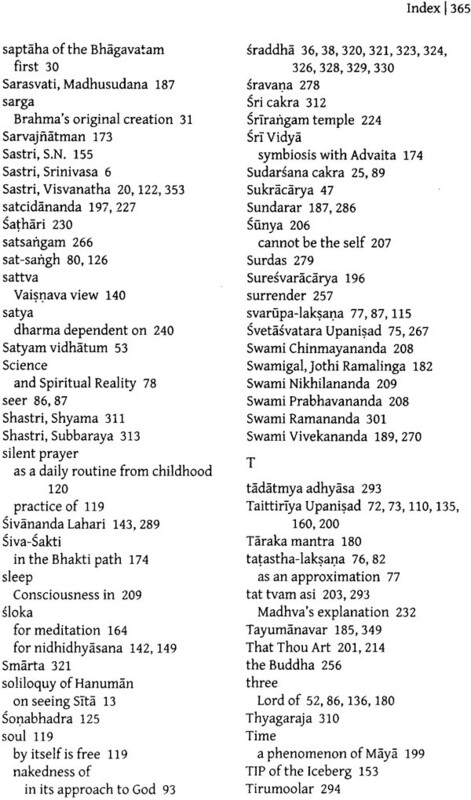 The entire life is a sadhana wotards Godly life and one can get peace of mind, prosperity, memory, mental stability, reputation and self-realisation by understanding this collection with devotion and attention. The collection, the order and the presentation are fine and genuine. We appreciate the steadfast Endeavour of Prof. V. Krishnamurthy in bringing our volume of collection from the ocean of Divine Bliss in the memory of his revered and beloved father. 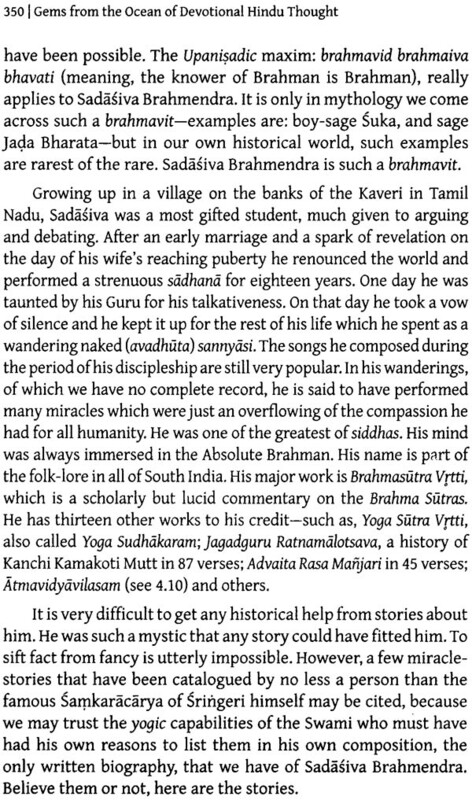 We pray sri Mahatripurasundari Sametha Sri Chandramouleeswara Swami to Shower His blessing on the author of this Book of Bliss who involved himself fully in bringing together the valuable and immortal pearls from the ocean of God realization. We bless him for his continuous and enduring service that brings spiritual solace to one and all. 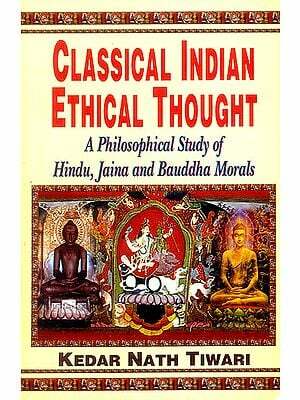 This is the second book in the series, Traditional Hindu thought. 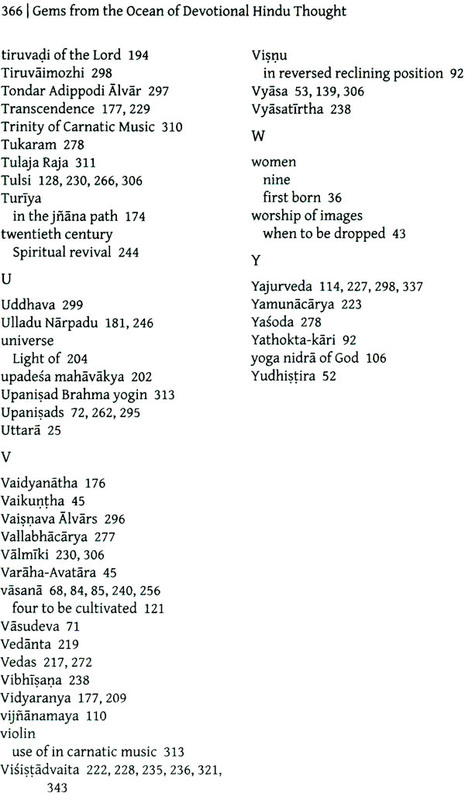 The first one is titled Gems from the Ocean of Spiritual Hindu thought. 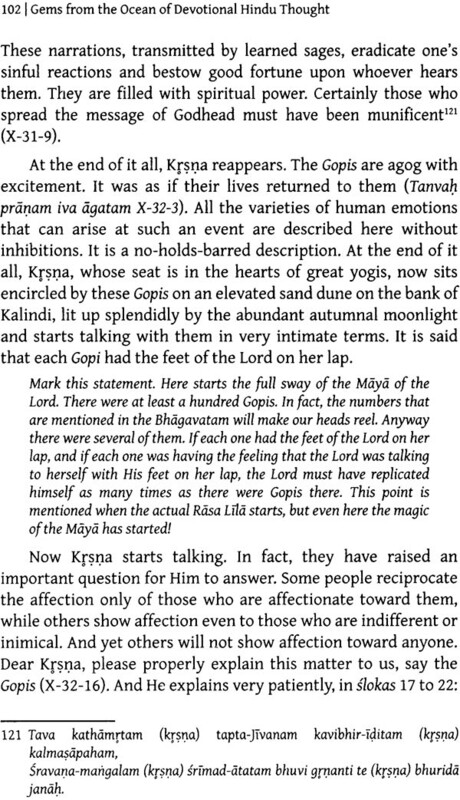 • Extracts from the bhagavatam, that include the stories of Prahlada and Dhruva which are household words in the Hindu world, the divinities of Krishna and Kapila that are direct sources of authority, the incomparable story of jada Bharata and the philosophical excursions of the Shruti Gita which take one to the apex of spirituality, one by its unbelievable actuality and the other by its intellectual heights of profundity.
. • A comprehensive index of men and materials covered in the book. 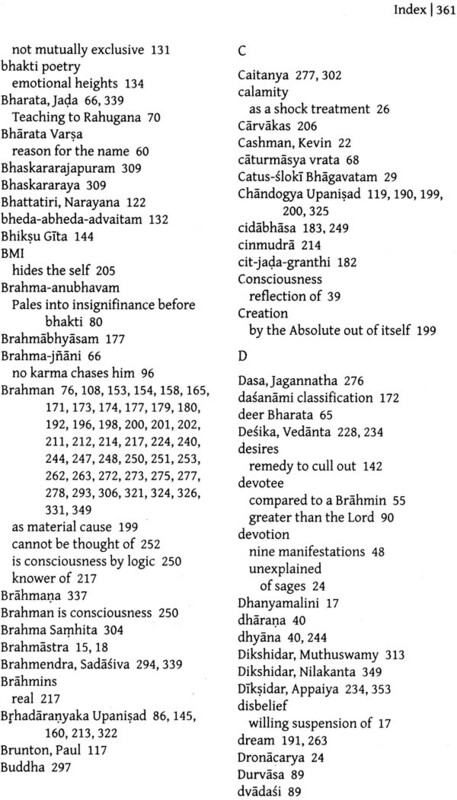 All non-English quotes (the bulk of them in the footnotes that together contain as many as 300) are presented in a uniform transliterated form to facilitate easy reading and also in translation in the main text to help uninterrupted flow of reading and easy understanding. Technical words or Jargon get their explanations each time they occur, but the explanations are limited to the context. One would benefit by tracing them through the index. One observation on the book could be that there seems to be a repetition of thoughts and emphasis. The explanation is clear. 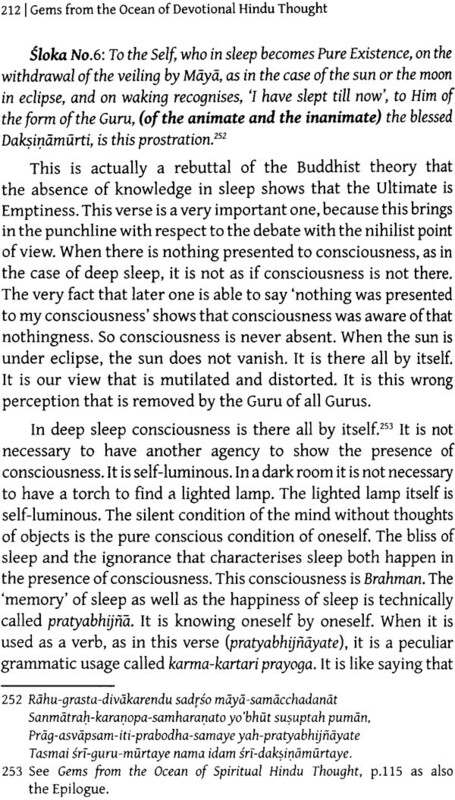 The bottomline of the traditional Hindu Philosophical perception is the constant awareness of God’s omnipresence. This is the point of the whole book. 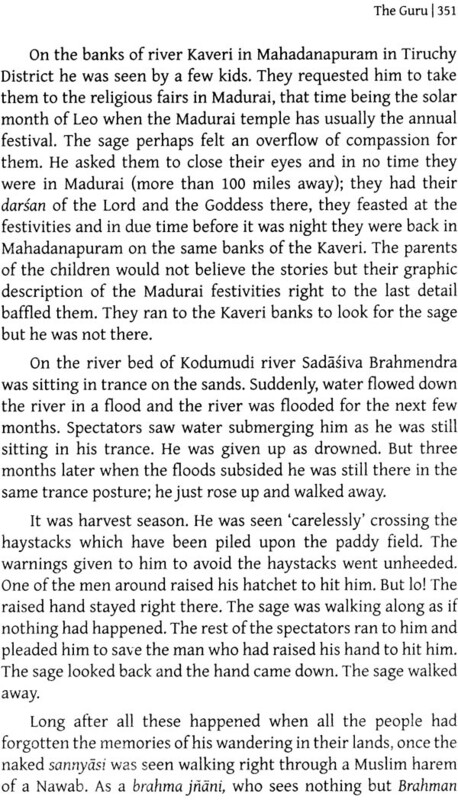 Throughout the past, from eternity, Hindu religious thought has swerved from this. Surely, it has had various dressings, but the fountainhead of thinking has been the same. One of the main purposes of the book is to bring this out. 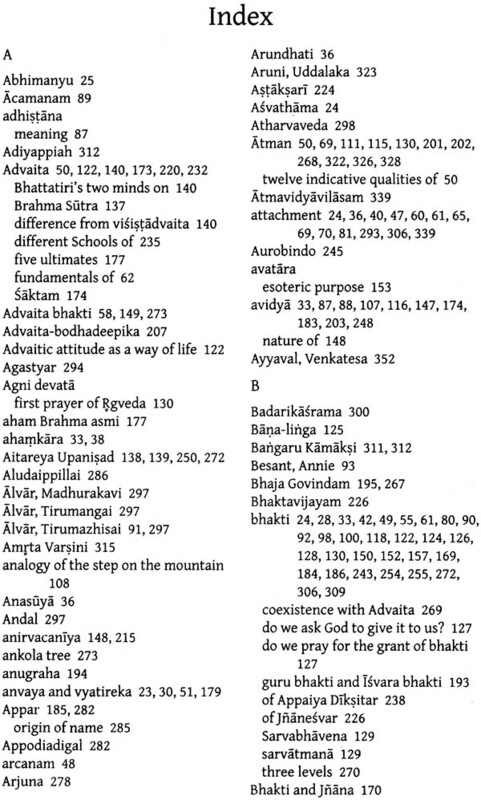 And in the process we naturally come across an unending panorama of sages, seers, masters, devotees, and role models, each of whom , without exception , have shown through their life and teaching that, there is no greater gain than Atma-labha (attainment of the self).each of these has thrown away material welfare as trivial in comparison with the towering strength of spirituality and godliness. This common characteristic of the spirit of devotion and spirituality certainly reflects as repetition of the same thought. On the other hand, the system of liberal cross-referencing (which reaches even into the first book of the series) helps the reader recognis the shades of nuances in parallel thoughts or interpretations. 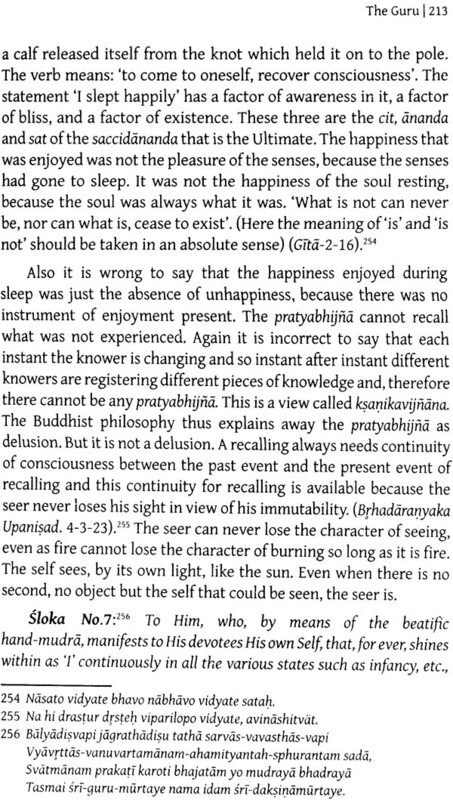 The recurring appearance of the same thoughts has another purpose, however. “Thinking of the Transcendental Absolute, Talking of that, and mutual exchange of ideas of that, these are the only recommended practical ways of ascent to that peak of spirituality where stand all those giants.” And a book like this does exactly that. 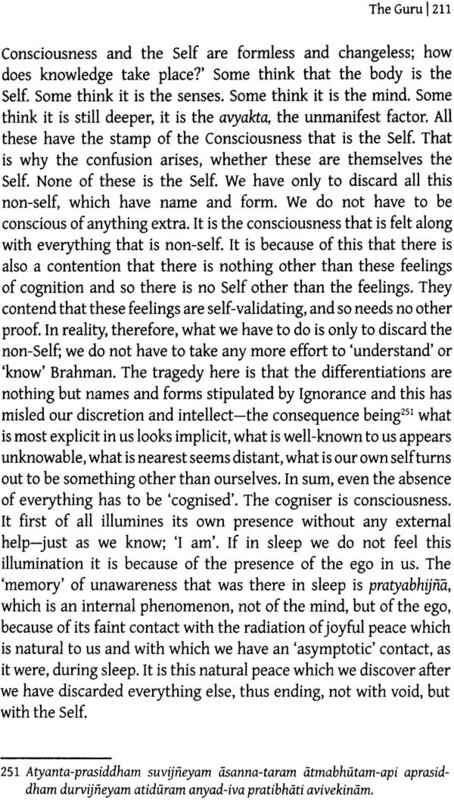 In doing that, there has emerged, even without the author intending it, an imperceptible undercurrent of movement from soft to hard of most of the ideas of Vedanta. 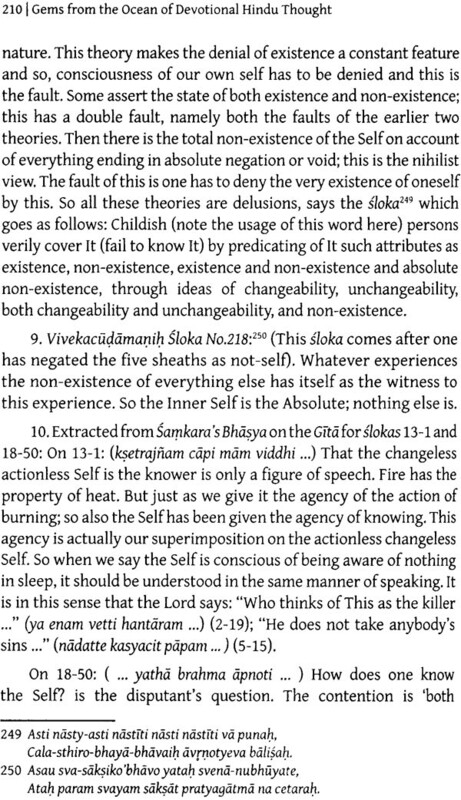 For Instance, the core fact of Advaita Vedanta, namely the identity between the individual Self and the Universal Absolute (jiva- Brahma- aikyam), is presented in varieties of gems from the Bhagbatam in ch.2, expounded through Shankara’s third shloka of Daksinamurti Ashtamkam in 4.0, and established, by the force of Ramana Maharshi’s unparalleled analysis, with all its nuances, in 4.3.10. the whole series has been written as a svadhyaya-yajna; if the feaders also take it to be one such, the purpose of the book is more than fulfilled! Numerous other ‘gems’ could have been included in the book. The author would not get away by giving the excuse that it would have increased the size of the book. 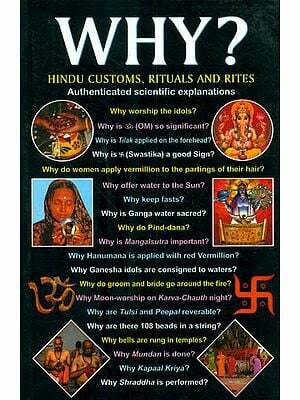 Though that could be possible reasons, the real reason is ‘Ignorance’! However, criticisms, as well as suggestions, for improvement of the present book are surely welcome. 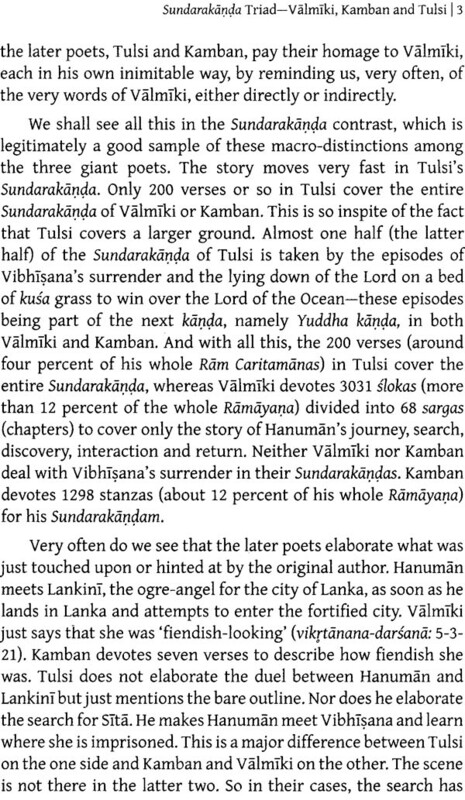 First of all, my humble acknowledgments are due to his Holiness the Shankaracharya of Kamakoti Mutt, Kanchi who has blessed me by writing a foreword for the book. The book has grown over a period of several years ever since I started writing on my website 10 years ago. Great is my indebtedness to the numberless exponents of the faith (starting from my father) whose inspiring books and speeches must have sunk into my system to such an extent that I use their words without the cognition that they are theirs. Over the years, several friends, readers and well-wishers have given me encouragement, appreciation, constructive criticisms and technical help. In mentioning a few names, I may be missing many more. I am , therefore, making a universal thanks to all of them by the famous lines of Thyagaraja: ‘ Endaro mahavnubahvulu andariki vandanamu’: great souls are indeed many. Pranams to them all! 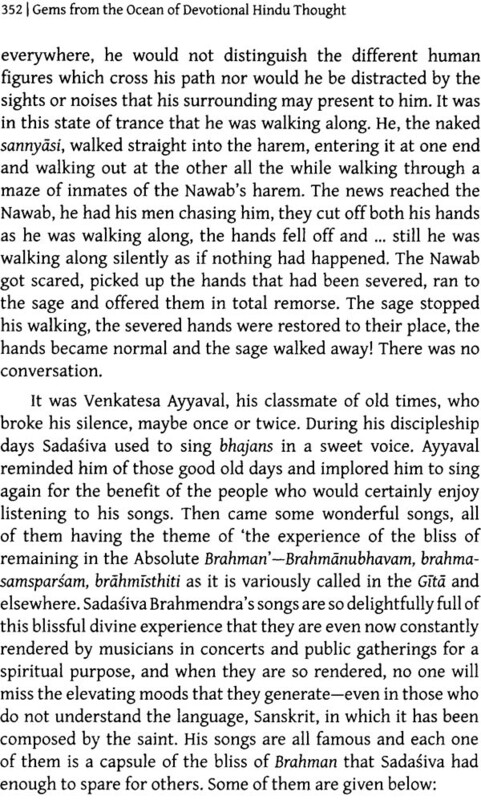 However, I would like to express my deep sense of gratitude to: Abhijit Jadeja, B. Madhavan, Br. Pranipata Chaitanya, Chittaranjan Naik, Dennis Waite, (late) Dr.S.Venkateswran , Ganapathy Vijaya, Gidu Sriram, Gomati Gopinath Harsh K. Luthar, Jaldhar Vyas, K.Balasubramanin, Ken Knight, K. Narayanaswamy, K.E. Raman, Kuntimatti Sadananda Madathil Nair, M.S Ravishankar, Prasd Kaipa , Ram V. Chandran , Ramakrishna Upadrashta, Rama Sharma, Ravi Gomatam, S.N.Sastri , S.V.R Iyengar, shailendra Bhatnagar, Shantibai Mehta, Shyam Sunder Hattangadi, Vijay Dikshit, V.L Swaminathan, T. Subramainian and V. Swaminathan. I appreciate and thank my wife Kamala and other family members for their patience and tolerance in allowing me the necessary time and energy to sit at my work, away from family responsibilities. Finally my thanks are due to my publishers, Readworthy Publications (p) Ltd. For doing a nice job. 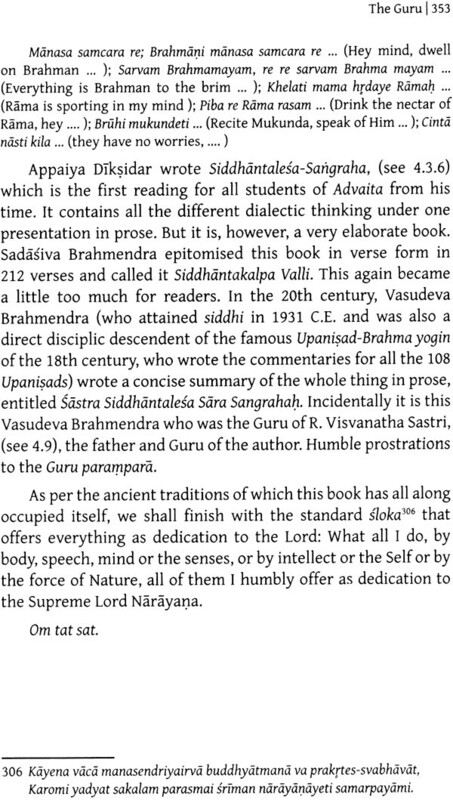 In all Vedanta books, particularly in a book of this kind which draws material from several authors in different contexts, it is easy to pull out a statement or opinion and presume that it is a summary of the whole content. Gita slokas 18-22 clearly say that knowledge limited by such a comprehension is only tamasic. Readers are requested to resiet the human failing of inadvertently slipping into this error. Instead, by reading the book back and forth one may aim at a total integrated understanding. Thanks.